Ryhall Village Hall is to launch a short film competition. The contest is being organised by committee member Nick Bellairs and will be held in the summer. Full details will be released shortly, but meanwhile get your cameras (or even your touchphones) ready and start filming. We have produced a new batch of super postcards celebrating the beauty of our parish. There is an all-year card plus one a spectacular winter special. 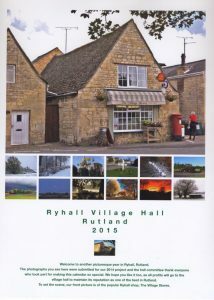 They are on sale at Ryhall Village Stores or from any member of the committee, price 60p each.